If you as a consumer buy something from a seller in business the terms upon which you buy the goods should be clear and fair to you. You should be able to understand what the contract means and the agreement between you and the seller must be legally enforceable. If there is a term in the agreement which is unfair, this doesn’t necessarily mean that the whole of the contract is invalid. However if the one unfair term makes the entire contract unworkable, then this would make the rest of the agreement void. A seller is not allowed to take away your rights as prescribed by law. You as a consumer are entitled to expect that your purchase is as described, of satisfactory quality and fit for purpose. The seller cannot seek to limit those rights in standard consumer contracts, in other words, unless otherwise agreed on an individual basis. As a result, you will often see “Your statutory rights are not affected” which is a standard term that retailers use that preserves the consumer’s rights under the law. Similarly, the seller cannot legally seek to exclude his own liability, for example, if the product causes injury to the consumer or provides the seller with a ‘get out clause’ if it breaches the contract with the consumer. Unreadable small print or unintelligible language can constitute unfairness. If you buy a sale item, it is unfair for the seller to prevent you from returning it for a refund simply because it was at a reduced price. As a consumer, you are entitled to the same legal rights regardless of whether you pay full price or not. The seller can sell second hand goods which are ‘sold as seen’ but with a warning that the standard of quality that consumers would normally expect might be lower than usual. It is not lawful for the seller simply to exclude liability completely in this regard. If the seller makes a false statement which entices you to part with your money, whether it’s in relation to goods or services, this is called misrepresentation. Misrepresentation can be fraudulent, negligent or innocent and depending on the circumstances you will be entitled to have the contract made void, a refund and in some circumstances compensation. pyramid schemes, in which a consumer pays money on the basis that they are offered an opportunity to earn money by introducing other customers to the scheme rather than by selling products. If you have been sold something on a basis which you consider unfair, the best thing to do in the first instance is get in contact with the Office of Fair Trading and report the trader. 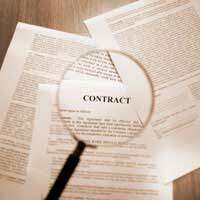 Whether or not the contract is unfair, and whether or not that unfairness makes it invalid, varies from case to case. It is only once the elements of the contract, the terms and the payments made under it are considered that you will know the extent of the compensation or refund to which you may be entitled.